The specifics of the ninth Liverpool Biennial have officially been announced this morning. 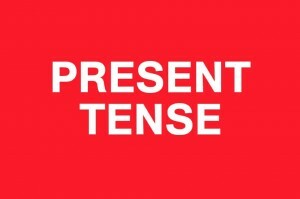 This Biennial will be based on the theme of Time Travel and be split into six episodes: Ancient Greece, Chinatown, Children, Monuments of the Future, Flashback, and Software. Each episode, said festival director Sally Tallant at press conferences in Liverpool and London, is a like a fictional genre: confined within itself, but still overlapping with other works to create a mesh of cross-disciplinary art in locations throughout the city. Visitors to the 14-week festival can look forward to a wide-ranging and sometimes bizarre mix of ancient and futuristic sculpture, performance art inspired by medical marvels, a look into the art of smuggling, and an abundance of fantastic fringe events. Some of our favourite announcements, out of an imaginative programme led by 40 artists, included the news that the Edwardian Adelphi Hotel will be giving full use of their swimming pool to Danielle Freakley for an exclusive set of swimming-costume-clad performances; Coco Fusco will be delivering a TED-style lecture on human psychology whilst impersonating Dr Zira from Planet of the Apes (1967); and the ancestor of Liverpool Metropolitan Cathedral architect Edwin Lutyens, artist Marcos Lutyens, will be performing — where else? – in the cathedral’s Lutyens Crypt. Time travel continues via a reference to Liverpool’s neoclassical buildings from the 1800s — which heavily incorporate the distinguished style of architecture produced by the Greeks before the first century AD. The Ancient Greece episode will be exhibited primarily at Tate Liverpool and National Heritage building The Oratory (located in the grounds of the Anglican Cathedral). National Museums Liverpool will be loaning pieces from its Ince Blundell collection to the festival, focusing on how flawed restorations can transform art to give it an entirely new meaning. 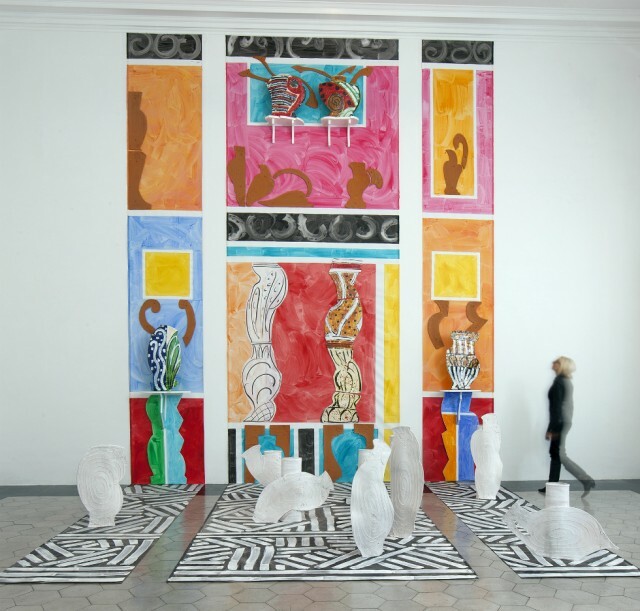 Described as a “spacetime collapse in the context of Ancient Greece”, pieces include Celine Condorelli‘s time portals, and a permanent wall installation by Betty Woodman (below) which will be unveiled outside the magnificently art deco George’s Dock Ventilation Tower. The Chinatown episode will be held — you guessed it — throughout Chinatown’s pubs, restaurants and supermarkets, which should make for some interesting eating and drinking experiences. This celebration of Chinese culture, interestingly, draws attention to the speculative future economics that the New Chinatown development will bring to the area — which is home to the oldest Chinese community in Europe. 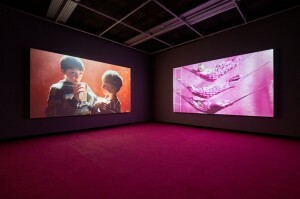 Iranian exiles and artistic trio Ramin Haerizadeh, Rokni Haerizadeh and Hesam Rahmanian (main picture) focus on the themes of smuggling and the trade of illicit objects through the Liverpool docks in their political project The Eighth Of A Kind (2014), which includes shipping all of their possessions over to the city. Meanwhile, Samson Kambalu’s photography of the Welsh Streets will tackle Toxteth’s ongoing abandoned housing struggle with the Council. 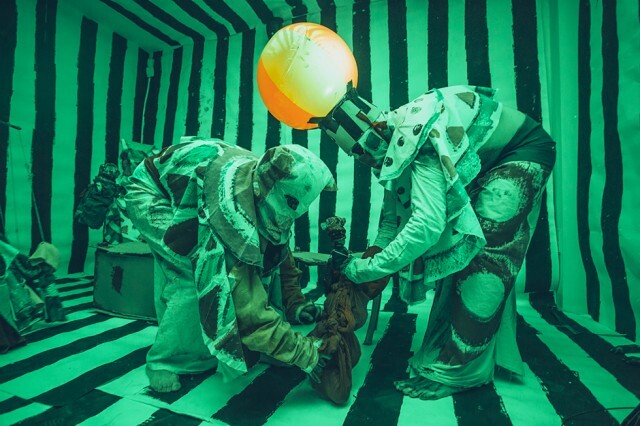 The Children’s episode, held at the Victorian Cains Brewery and dockside Open Eye Gallery, will incorporate Turner Prize nominated artist Marvin Gaye Chetwynd (below), whose bonkers new production, Dogsy Ma Bone, takes inspiration from one of her favourite cartoons: Betty Boop’s A Song For A Day (1936), where she nurses giraffes, hippos and billy goats back to health, and Bertolt Brecht’s 1928 socialist critique, The Threepenny Opera. Wanting to star a cast of youngsters, Chetwynd is holding auditions (apply here) for under 14s this Sunday. In an echo of the ever-popular Dazzle Ferry, produced by Peter Blake for the 2014 Biennial, creative studio Hato have been commissioned to redesign Arriva buses, alongside Ana Jotta and Biennial Associate Artist Frances Disley, which will run through Liverpool and the Wirral for three years. The first bus will be designed in June 2016 with help from the children of Liverpool, so keep an eye on Biennial updates if you have any budding Picassos willing to join in. In sharp contrast, Koki Tanaka will be reflecting upon a photography book he found in radical Liverpool bookstore News From Nowhere, depicting the city’s youth student strike in 1985. Monuments from the Future, meanwhile, is an episode focusing on anachronisms through sculpture, with the Granby Four Streets, Liverpool ONE, Clarence Dock and Cains Brewery all listed as venues. Expect a planet-inspired piece by Arseny Zhilyaev, and a collection of neoclassical sculptures being flooded atop of a new monument in Clarence dock by Lara Favaretto, which is said to signify the persistence of memories. Fittingly, Flashback will also look back into the past, just not in a way you might expect. Fabien Giraud & Raphaël Siboni present The Unmanned 2045 — the year predicted that machines will overtake humans, and how that affects our past and present — at the soon to be redeveloped ABC Cinema (located opposite Lime Street Station) and Open Eye Gallery. 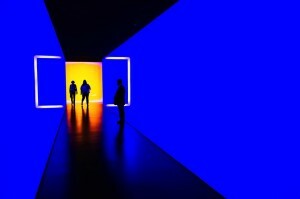 Krzysztof Wodiczko will be giving voice to the marginalised through photography at FACT, and the Ellesmere Port-born, Turner Prize winning Mark Leckey will present found amateur footage of a Joy Division gig he went to as a teenager, entitled Dream English Kid. The final episode, Software, wants you to download the Biennial with the help of Oliver Laric. The artist wants to 3D-scan the Walker collections to create a free, 3D online gallery. Expect artworks created inside the open-world video game Minecraft; an app processing the interactions between humans and non-human species developed by Ian Cheng; and Lucy Beech‘s (above) look at rare medical condition Morgellons syndrome: the delusional belief of having a bodily infestation of fibres. Venues for this edition include FACT, The Oratory, the Bluecoat and, of course, the World Wide Web. Extra Biennial partner events include a Frieze weekend (8-9 October); 46 Bloomberg New Contemporaries at the Bluecoat; and the 29th John Moores Painting Prize, starring the work of 54 artists (until 27 November), with the grand winner being announced 7 July. Suzanne Treister (above) will be showing her futuristic new work HFT The Gardener at the ERC gallery (LJMU School of Art), starring a fictional character in a high frequency bunker and 174 other scientific and botanical pieces. In addition to the official programme, The Double Negative will be widely distributing a special Biennial Fringe Edition of Culture Diary to keep you up-to-date on all the alternative Fringe highlights — including a Domino Records’ Portrait of British Songwriting exhibition at Bold Street Coffee; Mexican street art at Corke Gallery; conferences from Goldsmiths University of London and LJMU; a DJ party hosted by the aforementioned Mark Leckey; and an extensive film programme at FACT every Thursday throughout the Biennial, co-curated by Steven Cairns of the ICA and Picturehouse Cinema. Are you hosting a fringe event? We want to hear about it! Please follow this guide and get in contact before 6 May.